A whole program of Cabeza de Vaca on Scanner FM dedicated to the music of Rene Pawlowitz! Pawlowitz is from Schwedt in the former GDR right on the border with Poland and spent at least some time living in Frankfurt Oder, a larger town slightly to the south of Schwedt (and not Frankfurt am Main on the west side). He doesn’t always give a lot away biographically, but his formative years seem spent acquiring the usual influences from the main stream (Pet Shop Boys) until being old enough to attend raves in the relatively near-by Berlin. It is probably his term working at Hard Wax that left the biggest mark on him and the shops focus as a communal hub as well as a record store comes across strongly in interviews. 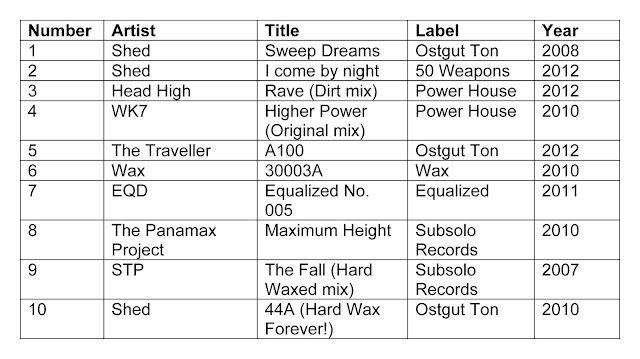 In the show, the last two tracks I play re named in homage to the store. Pawlowitz started out releasing on his own Soloaction Records in 2004 before a breakthrough single on Delsin set him well on the way. He claims that the name Shed comes from the phrase “Shedding the Past” although the album would not appear until 2008. He would also go on to use STP for Shedding the Past as a further name. However, the term “Shed” used like a snake shedding a skin is clearly something that he had in mind when adopting the name and one that works in his favour having employed so many monikers. One aspect of techno anonymity has also been the white label or the hand stamped 12” in a white paper bag as a way of hiding artist identity. Another is to employ so many names that the listener (or critic) does not know who the real artist is. I also like the interpreatation that Shed couldrefer to a shed like a workshop, like where my father repairs things for his farm or builds something to help him go fishing. Shed tracks are often like little inventions with moving parts, but sometimes a little clunky. One does get the feeling sometimes that Pawlowitz does not want to be considered an artist almost. It is not a mantle of responsibility that he seems comfortable living with somehow. One thing that is particular to the Pawlowitz aesthetic, however, is the balance between the drums and the synths. The rhythm section is generally always high in the mix and cut quite roughly, and almost rigidly without much elasticity between the parts. The percussion doesn’t move like a complicated machine or a watch, but it moves with heavy and calculated force almost in stop-motion fashion. The roughness imparts a sense of stoniness, of a literal underground or cavernous sound decorated with hints of metal, but metal is not always the dominant sensation and the stone feeling is organic and elemental and dismisses any desire to label the music as industrial. The synths used are generally abstract, infrequently employing overt melodies or pop techniques, though there are exceptions such as “Rave (dirt mix)” by Head High. Most of the sense of movement is carried in these sounds, however small or angular, despite carrying little emotional information. Their fluidity at times only emphasizes the sense of stasis in the heavier percussion and their respective balance in the mix further exaggerates the tension between the parts. A necessity to produce this type of sound design is the breakbeat. If Pawlowitz had been a conventional 4-4 techno producer, a lot of this tension and stasis would not exist (look no further than the opening track “Sweep dreams” for example). Pawlowitz expresses more love for dubstep in interviews than he does for techno which makes it something of a surprise then that his dubstep identity Panamax Project is arguably his least successful and one of his least used. In any case, all the Shed albums are heavily populated with breakbeat tracks. One of the key concepts when talking about Pawlowitz is also his approach to what an album is. The best place to start is the text quoted on the back of “The Traveller” album from 2010. I am not sure who TH is although I read that the text was also included in the press release for the album. Whether this was the press releases quoting the album or vice versa is unclear, but it is also possible then that TH is someone from Ostgut Ton. In any case, the issue raised is whether an album is more complete being stuck together with ambient interludes and a downbeat track and whether this somehow makes it more artistically sound. It is true that there was a time when every electronic album had on it a track called “Intro” and “Outro”, something you don’t see so often now. But the question about “The Traveller” and “The Killer” is whether they do really form cohesive albums or not, or whether that is the point. With “The Traveller” it is much easier to understand the album by taking each track as a point of departure and a point of destination, since their extremeness and their often dissimilarity makes it difficult for them to flow together in some instances. “The Killer” is less extreme, but not always more cohesive in its final totality. Judging success here is tricky. There are plenty of good pop-rock album’s that are just great collections of tracks that do not necessarily form a concept, so why can’t an electronic album be the same? Of course the greatest albums are those that usually tell a story and work like a novel from beginning to end and offering somewhere a turning point or a moment of transition. “Shedding the Past” is an altogether other problem of interpretation. As I mention at the beginning of the show, the vinyl and CD versions are vastly different. Not only is the number of tracks different, but the tracks they contain are not the same and in different order. Reviewing the album, which one would you take? When referring to the album should we specify which one we mean? The notion of a changeable album is not unique to Pawlowitz, but given the above quote about the album format in techno music, it is something that he obviously does not take lightly. But should an album be changeable? It is impossible to imagine “Sgt Peppers” working in a different way, but “Rubber Soul”, how much does it really matter in the way that the songs go together? There are many reasons why an album could change in this day and age. A generation has now grown up with CDs and skipping tracks, whereas almost every other format of art now offers the choice of versions. Films have director’s cuts and even books appear with new and definitive texts. William Burroughs is a key example of this not only for his and Brion Gysin’s cut up method which is fundamental to this idea, but that many of his books have appeared in multiple versions as new parts are discovered or as Burroughs changed the text through desire. An interesting counterpoint is perhaps painting. I am not aware of any panting that has been systematically or occasionally modified in time once presented to give it new meaning. A minor sub point of the changeable album idea is format and running order. 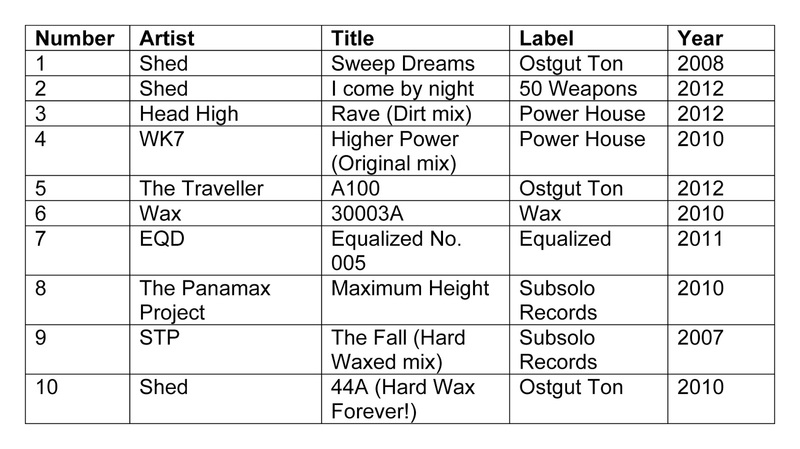 Quite often the definitive running order is on the CD as opposed to vinyl versions as vinyl will often cut out tracks, such as on the recent Shifted album, something I referred to in the ambient show a few weeks back. This is frustrating, but obviously an artefact of the physical limitations of vinyl. The running order is also often different which has as much to do with the sound characteristics of the grooves which changes from the outside to the inside as any Masterer will tell you. I personally like the fixed idea of an album as a work of art, as something takes on a configuration of its own and acts almost as a symbol of an artist and his time. But perhaps this is the point of Pawlowitz and his album work: the times they are a changing. It is also worth referring briefly to some Pawlowitz collaborations and aliases that I didnt play in the show. There is obviously Deuce which he dd with Marcel Dettmann. There is also the collaboration with Modeselector and Marcell Dettmann called A.T.O.L who had their debut at the Melt Festival, but have so far not released anything. There are two new names that appeared on Pawlowitz's Discogs page even as I preparedthis show, one which is Zigg Gonzaless/Sigg Gonzalez which links to a track just on Ben Klock's Fabric mix (not to be confused with Ziggy Gonzalez who is another artist) and released on Belgian label H2, whereas War Made Easy appears to be a new alias that accompanies a new 12" on the War Easy Made label.